In March, "Meet the Press" host Chuck Todd made an ad for his show in which he lamented to the public: "What about our politics? Are there any rules anymore, and if so, will anybody play by them?" Todd assured viewers that he and NBC would enforce some rules. "These days, politics could use a little refereeing," he intoned. "And we're not afraid to blow the whistle." Wrong. The rulebook is being shredded. 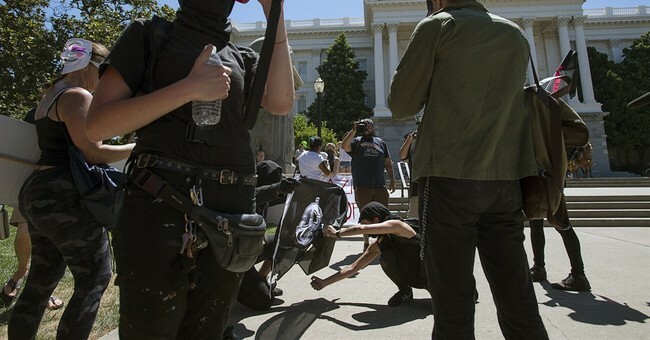 The antifa movement, or anti-fascist movement of far-left-leaning militant groups, is justifying violent action in the streets to beat back racists and neo-Nazis. Violence -- not as an accidental outburst but as an explicit strategy -- used to be seen as a beyond-the-pale extreme. Now Todd & Co. are ushering antifa's extreme into polite society. The NBC referees believe rioting is worth at least some respect as a way to jolt the debate to the left. On the streets, the real referees, the police, are getting injured with rocks and urine-filled bottles to the head. We've lost count of the number of cops who have been murdered by Black Lives Matter supporters. Todd used the Aug. 16 "MTP Daily" show and the Aug. 20 "Meet the Press" show to promote an author named Mark Bray, who wrote a book about antifa. Bray argued: "Nazism and fascism was not stopped by polite dialogue and reasonable debate. It had to be stopped by force." Therefore, violence is necessary. So who was chosen to debate the antifa militant? Someone one notch to the right of antifa. At NBC, the spectrum runs the gamut from militant left to radical left. Bray's opponent was Richard Cohen of the Southern Poverty Law Center, or SPLC. The center has been smearing Christian conservative groups as "haters" for years. It just released a report on 917 alleged hate groups, including the Tea Party Patriots, Phyllis Schlafly's Eagle Forum and the Family Research Council. In perhaps the greatest display of hypocrisy thus far in the 21st century, Cohen denounced antifa's tactics by stating, "It's a very peculiar notion of self-defense to say you can censor people." For years, NBC has demonized conservative movements by arguing that their speech leads to violence. On Jan. 3, 1993, then-"Dateline NBC" host Jane Pauley smeared the pro-life movement by saying: "Still ahead, the latest round of bloodshed and violence at abortion clinics. The anti-abortion movement has been creeping to the edge of bloody fanaticism for a decade." A few months later, after the Oklahoma City bombing, then-NBC anchor Bryant Gumbel blamed Rush Limbaugh and the rest of conservative talk radio, claiming their anti-government invective "may embolden or encourage some extremists." Chuck Todd isn't out there saying antifa is "creeping the to the edge of bloody fanaticism" any more than he would host a debate called "Blowing Up Abortion Clinics: Fair or Unfair?" Eight years ago, NBC and MSNBC were warning that the peaceful tea party rallies were dangerous. Then-MSNBC anchor Contessa Brewer fretted over "A man at a pro-health care reform rally" wearing "a semiautomatic assault rifle on his shoulder and a pistol on his hip." Then-MSNBC host David Shuster suggested protesters at town hall meetings were a threat to then-President Obama's life. He said, "Is this putting our president in some sort of danger because of some wacko that will see this stuff and say, 'Oh, yes, it's fascism, and the way we dealt with Adolf Hitler was to try to kill him, so therefore, let's do this with our president.'" The only consistent thread in any of this is that NBC and MSNBC aren't referees and they don't have a rulebook. They want to achieve the left's aims by whatever means necessary. One arm of the far left believes violence is necessary. NBC thinks it's worth discussing.